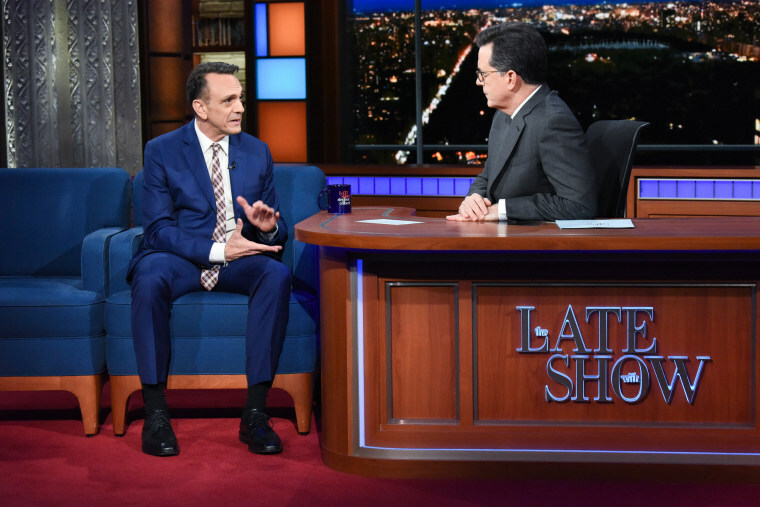 Appearing on “The Late Show with Stephen Colbert,” Azaria spoke about the controversy surrounding Apu. Actor Hank Azaria said he’s willing to “step aside” from voicing the character of Apu Nahasapeemapetilon on “The Simpsons” following recent criticism that the character advances stereotypes. Appearing on “The Late Show with Stephen Colbert” Tuesday night, Azaria spoke about the controversy surrounding Apu, the Indian Kwik-E-Mart proprietor. "The idea that anybody, young or old, past or present was bullied or teased based on the character of Apu, it just really makes me sad," Azaria told Colbert. "It was certainly not my intention. I wanted to spread laughter and joy with this character, and the idea that it's brought pain and suffering in any way, that it was used to marginalize people, it's upsetting." In November, comedian Hari Kondabolu's released “The Problem with Apu,” a documentary focused on the character and overall negative representation of South Asians in media. The film features Kondabolu and fellow comedians Aziz Ansari, Hasan Minhaj, Aparna Nancherla, among others, discussing the character and how he's affected their lives. Kondabolu said then that while he and Azaria have yet to have a conversation about Apu’s legacy, he would be open to it. newsHas Hollywood's diversity discussion reached voice acting? “I would absolutely talk to him. Ultimately the film is about accountability it’s about respect, it’s about open dialogue,” Kondabolu said in November. Azaria and Kondabolu did not respond to requests Wednesday for comment. The controversy came back to light after the April 8 episode of “The Simpsons” addressed the criticism. That episode featured Marge Simpson sharing her favorite childhood book with daughter Lisa before realizing that it’s more racist and offensive than she remembered. That wasn’t funny to Kondabolu. "In 'The Problem with Apu,' I used Apu & The Simpsons as an entry point into a larger conversation about the representation of marginalized groups & why this is important," he tweeted on April 9. "The Simpsons response tonight is not a jab at me, but at what many of us consider progress." The following week, “The Simpsons” showrunner and executive producer, Al Jean, responded to the episode’s feedback on Twitter. “I truly appreciate all the responses pro and con. Will continue to try and find an answer that is popular & more important right,” he wrote. During Tuesday’s interview, Azaria said he was not involved with the show’s response to the criticism and would be willing to transition out of the role. "I really want to see Indian, South Asian writer, writers in the room. Not in a token way, but genuinely informing whatever new direction this character may take, including how it is voiced or not voiced," Azaria told Colbert. 20th Century Fox Television spokesmen Michael Roach and Chris Alexander said the show’s producers declined comment.